An Xbox 360 Wireless Adaptor is connected but not configured. Try the configuration steps on this page to resolve the error. If you are prompted to do so, select your wireless network name, enter your wireless password (if required) and then select Test Xbox Live Connection. Note If you do not know your wireless network password, see Find your wireless network password. If you are not prompted for a wireless network name, go to the next step. On the Basic Settings tab, select Wireless Mode. Select your wireless network name. If your wireless network is not listed, select Specify Unlisted Network and then enter your wireless network name. Enter your wireless network password, and then select Done. Press B on your controller to retest your connection. If you get a different error message, see Error & Status Code Search for help. You can find your wireless network password in a several places. Alternatively, you might also check the router documentation or ask the person who configured the router to determine the password. On your computer, click the wireless strength indicator in the notification area in the lower-right corner. 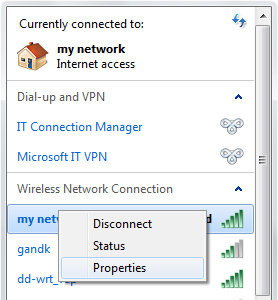 Right-click the wireless network name, and select Properties. Select the Show characters check box to see the password. Type the default IP address for your router or gateway and press ENTER. Here are the default IP addresses for a few router/gateway manufacturers. If the manufacturer of your router isn't listed in the table, refer to your router/gateway documentation or the manufacturer's website for help. Type the user name and password for your router or gateway, and then click OK. Note If you can't log in, refer to your router documentation to find the default user name and password. If you successfully logged in, you'll see your router or gateway's configuration page. 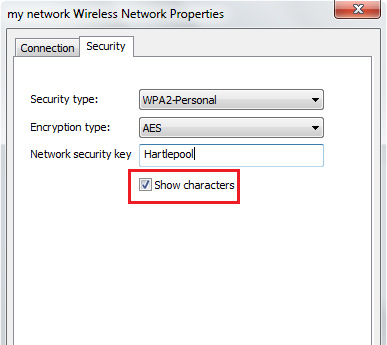 Find the wireless settings area and look for the passphrase or WEP, WPA or WPA2 password. Note If you have problems configuring your router or gateway, contact the hardware manufacturer or visit its website. Would you like to contact Support regarding the "Error: “Xbox 360 Wireless Adaptor is connected but not configured”" issue you were reading about or a different issue?